We are accustomed everyday to witness more and more evidence of the extreme Nationalism promoted by FYROM and its Diaspora. Especially FYROM’s diaspora groups from Australia and Canada are proved to be the most radical, promoting enmity against Greece and Greek people while showing the most aggressive aspects of nationalism. It has become a frequent phenomenon for them to promote Irredentist wet dreams mainly from publications and their sites. Today a friend sent us a mail urging us to take a look at FOMKUD (Federation of SlavoMacedonian Cultural Artistic Associations) and the Irredentism against Greek promoted through their site. The following pictures from their site speak by themselves!! 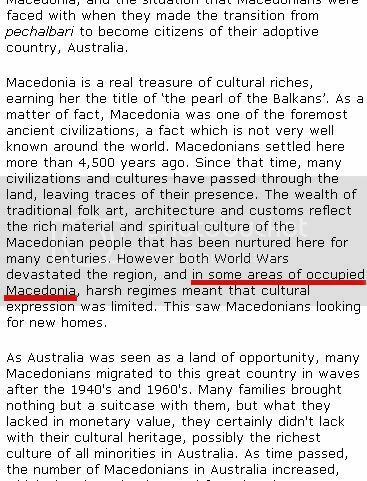 Aside from the laughable nonsense found inside that makes someone wonder whether these people are living in a paralel universe like for instance the line “ Macedonians settled here more than 4,500 years ago.” we also find again more wet dreams about “areas of Occupied Macedonia”. Btw YPEX, isnt the 16-rayed sun a Greek State Emblem according to WIPO?? As soon as you arraign in the relevant International Bodies the usurpation of the Internationally-recognised Greek State Emblems you will make a positive step to put an end to the Irrendentist dreams of FYROM and its Diaspora.